I think I could eat some variation of Mexican food every single night of the week! I love making taco salads because you can still have some yummy rice and/or beans and then pile your meal high with all sorts of fresh vegetables! 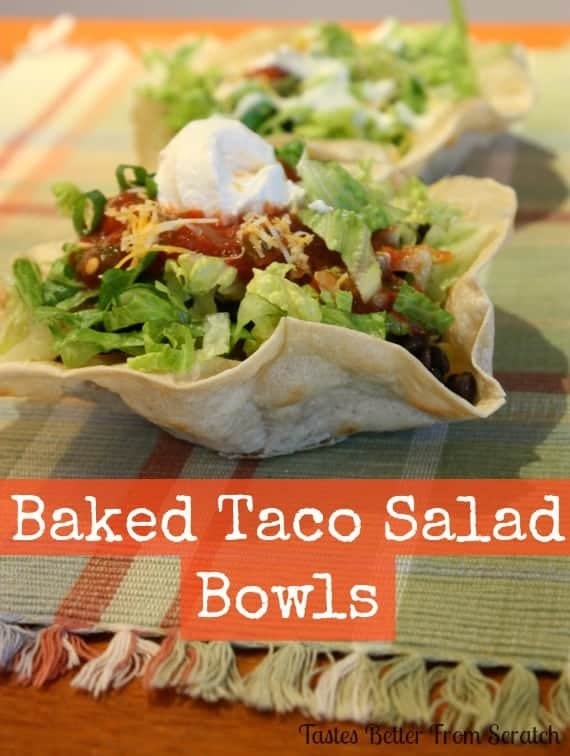 This is a super easy meal to whip together and picky eaters can pick and choose what they’d like to put in their baked taco salad bowl! And there’s just something fun about eating out of a tortilla bowl. You can make these with regular flour tortillas, or with flavored tortillas like spinach and sun-dried tomato. I love to tear pieces off the sides of the tortilla as I eat. Jeff likes to save the tortilla for last. 🙂 Either way, this is a simple dinner idea that everyone will be happy with and, hopefully, enjoy eating! Place oven-safe bowls or ramekins upside down on a baking sheet. Choose a bowl or ramekin that will be the right size for the tortilla you are using. Stoneware, ceramic and glass bowls work well. Spray bowls with cooking spray. Place one tortilla over each bowl and cup it gently with your hands around the edges to form your taco bowl shape. 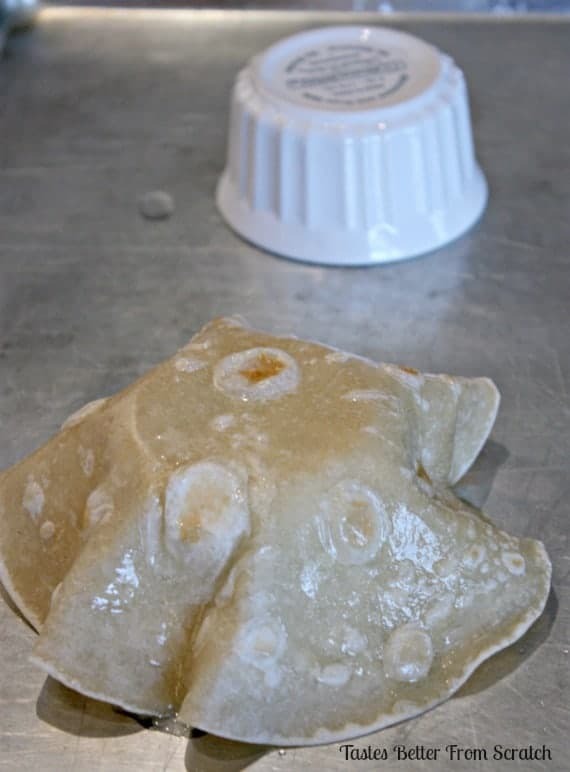 With a pastry brush, lightly brush a very thin layer of oil over the sides of the tortilla. Bake at 350 degrees for 10-15 min., or until the tortillas begin to brown and become crispy. Fill taco bowl with desired toppings! Forgot to mention that I did make your potato salad last night with our dinner. Hubby liked it and so did I! Like I said, you can never have too many potato salad recipes. Yum this looks delish!! Thanks for sharing! Ty and I tried this yesterday and it was so yummy!! Thanks for the idea Laur. 🙂 I hope you and your cute family are doing well!! Oh and just to let you know I’ve got a Photobook giveaway from Smilebooks going on this week. Three winners will each get a free photobook valued up to $300 each!! Come on over… low entries! Great topic and wonderful information! A little history lesson in art appreciation…I feel a little smarter already.